Today was another spanner in the works, to add to the ever-growing pile of spanners. Uni. Take 2. Bring it on. This time, however, I am at a postgraduate level, working in a Professional Learning Group (PLG) called the Manaiakalani Digital Teacher Academy (MDTA). I have been both nervous and excited about today and what the future has in store. Especially as I am a dinosaur when it comes to technology! For this reason, I am counting my blessings today was a basic Google 101. Phew! I now know the simple things I need to know for efficient and effective use of the digital world within my classroom. Check my snazzy slide, explaining the basics I learnt today. May seem minimal to some, but for me it's a step towards expertise, which will come. You are a star. They are stars. Be stars together. I believe every student shines in their own way, they just need the opportunity to shine, which is my job. I think many students in lower socio-economic areas particularly have low self confidence, thus do not allow their potential and ability to shine through. 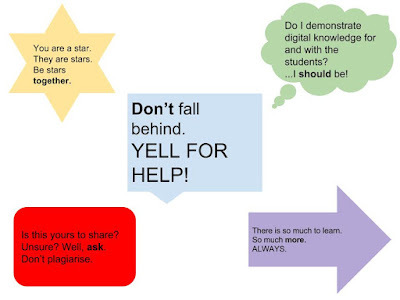 I know I am a star, so I need to show this to my students, to bring out the star in them. Without stars, there is no light in the dark, no light equals no learning. Together, the students and I can make light as we shine. Do I demonstrate digital knowledge for and with the students? ... I should be! Today I had a lightbulb moment. How on Earth can I expect students to build upon their digital skills, if I cannot demonstrate new and exciting things myself? As aforementioned, I am totally behind the times, which is why I feel so privileged to have an opportunity to become a techno whizz, but this means I have a lot to learn to be on par with the students. Feeling sub par isn't all that dandy. Is this yours to share? Unsure? Well, ask. Don't plagiarise. I was so excited to learn about the 'Research' tool that can be utilised in Google Docs (Can this magic tool be used in other apps? Can't wait to find out! ), I wish I had've learnt about it years ago for University assignments. No excuses for my future papers now! Alongside this treasure, I learnt how to search for things that don't need referencing, which means students can use pictures for example, and not be breaching any copyright rules! This is genius. Pure gold. There is so much to learn. So much more. Always. Although when I made the slide I was relating to Google apps specifically, this is appropriate for life holistically. I will definitely be discussing this with my Health students at some point, as I believe it is important to understand there is always more. If you want to learn more, ask. Extend your thinking further. Push yourself. Reach your limits. Learning is not confined to periods spent in a classroom, but confined to your open-mindedness and imagination. Don't fall behind. YELL FOR HELP. Although this is going to be hard for me, I know it is crucial. 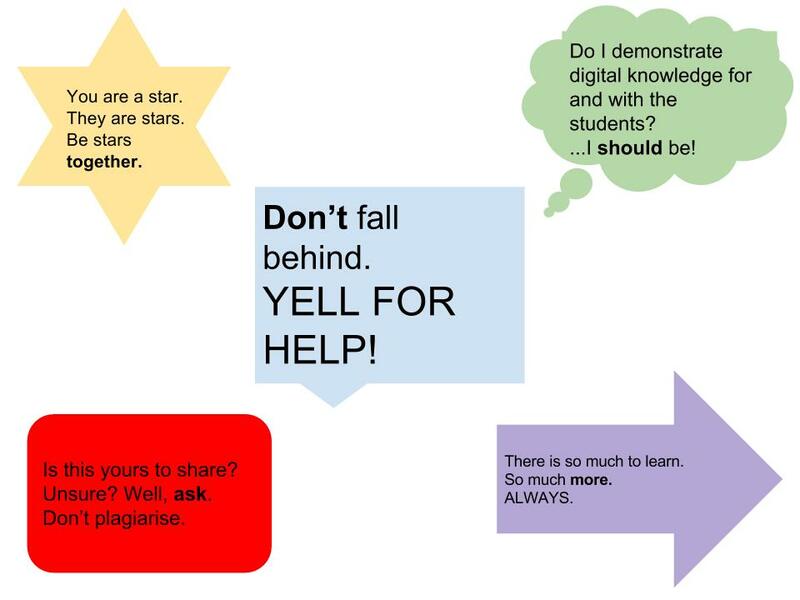 For both my sanity and to ensure student learning is the best it possibly can be. I am petrified, but also over the moon with this opportunity. Although I am feeling a little overwhelmed right now, it is all part of the challenge. Challenges aren't supposed to be easy, but they are supposed to be rewarding. This program is going to be incredibly rewarding once I cross the finish line. Extrinsic motivation can go a long way, so seek it. How about here?